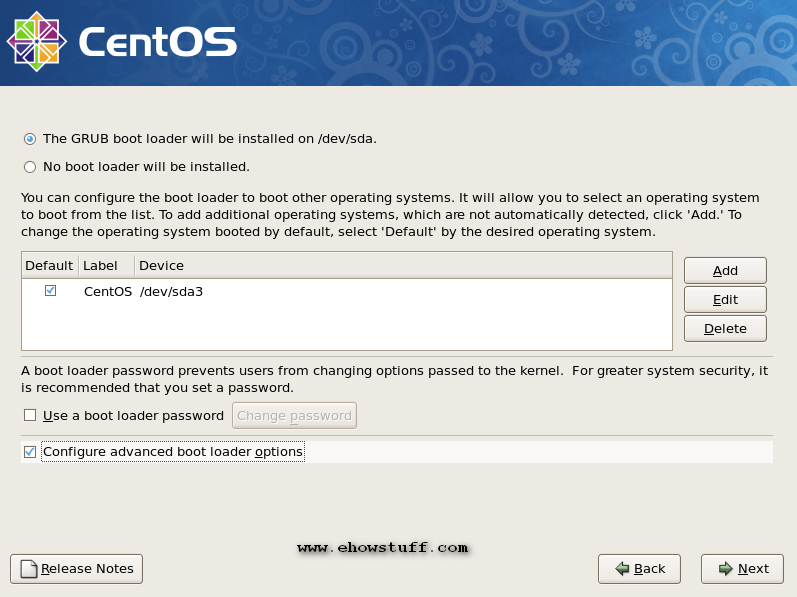 This tutorial shows how to install CentOS 5.7 32 x86 server. This steps may be similar with other version of CentOS or RHEL and i do not issue any guarantee that this will work for you. Assume that you already done the steps 1 until 12 as explained from this link. 13. Set configuration for boot loader if you need. In this case, click next to proceed. 14. Install bootloader on /dev/sda. 15. By default, the setting of the network interfaces is DHCP, but it is recommended to set static IP addresses for server installation. 16. Under IPV4, uncheck “Dynamic IP configuration (DHCP)”. Enter prefer static ip address and netmask. Don’t forget to uncheck “Enable IPv6 support”. 17. Input your server’s Hostname, Gateway and DNS servers. 18. Choose your time zone. 19. Set root password and click next. 20. Select softwares you would like to install. It’s recommended to perform minimal installation. Check a box “Customize now” and click next. 21. To perfome minimal installation, unselect all package groups. 22. Click next to proceed. 23. The installer checks the dependencies of the selected packages and the format file system. 24. Installation has been completed. Click ‘Reboot’ button.